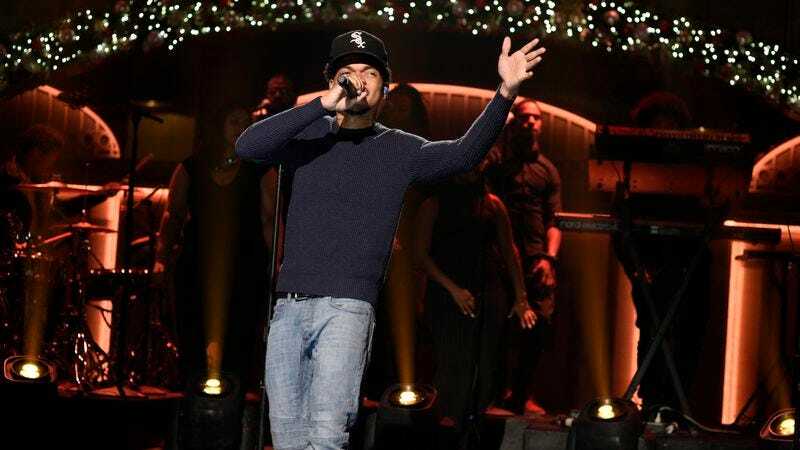 Yesterday, Saturday Night Live announced that Chance The Rapper would be making a return trip to Studio 8H this year, serving as the musical guest for the show’s Casey Affleck-hosted outing on December 17. Last time he was on SNL, Chance treated live audiences to renditions of “Somewhere In Paradise” and “Sunday Candy.” This time, the Chicago rapper will be dipping into songs from his third mixtape, Coloring Book, for his two musical slots. But which ones? No, seriously, Chance wants to know: Which songs should he play on SNL? The White House favorite and Kit-Kat pitchman put out the call on Twitter yesterday, explaining that he’s trying to perform the entirety of Coloring Book on TV—a goal he’s about halfway through at this point, thanks to performances on The Tonight Show, The Late Show With Stephen Colbert, Ellen, and Good Morning America. But he still wants fans to chime in on which songs he should play two weeks from tonight. So why not hop on social media, and take this rare opportunity to offer solicited advice to a beloved celebrity on Twitter?